The VLC packages which I created to accompany the release of Slackware 13.1 support the playback of WebM video, the Google-sponsored new free video format. The VLC command-line allows to encode/transcode WebM video! Want to try it out? When the command prompt returns, your transcoded WebM video is ready! If you use “vlc” rather than “cvlc” then you will see a VLC window appear but instead of playing the video, it will just show the slider moving forward which is actually a good indicator of how far the transcoding has progressed. Posted: 26 May, 2010 in Software. 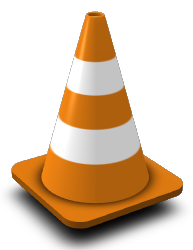 vlc: unknown option or missing mandatory argument ‘-s’. Maybe it does not work for mp4 files? Sorry about the double – it said wrong security code and to try again. I also didn’t mean for that to run all over the page. No problem 🙂 It’s not your fault but the wordpress software’s. I’ll delete the double post. Although the rc1 did work perfectly on the same computer ! Yes I have seen crashes too, and they were all related to VAAPI (GPU hardware acceleration). If you have my vdpau-video package installed (for Nvidia GPUs), please check what happens after you remove that. The same advice for the libva package in case you did not have vdpau-video installed. I have uninstalled your libva package ( no vdpau-video package installed ) and reinstalled vlv 1.1.0 rc2 again. Same result : immediate crash with Segmentation fault ! In the meantime, I am rebuilding vlc-1.1.0-rc2 with debugging enabled, so that I can generate a meaningful backtrace in the debugger. I rebuilt the vlc-1.1.0-rc2 package and added “–enable-debug” to VLCs configure command, also commenting out the stripping of binaries. I hope someone can make heads or tails of this. I am not a VLC developer nor a programmer, so I can not determine why the segfault occurs. The file where the segfault occurs, is identical to the one in vlc-1.1.0-rc1 and the libva package I have installed did not change either. When I remove the libva package and start VLC again, I do not get a segfault and the video plays normally (but without hardware-supported decoding of course). So could you put back the 1.10 rc 1 packages of vlc beside the rc.2 ones ( in pkg64) in order I can reload them and have a vlc working on my computer ? I am building RC3 packages at the moment and when I upload those, I will also add back the RC1 packages… just to be sure. @alienbob : Thanks ! I will test the RC3 packages as soon as you will upload them and let you know how they work. The RC3 packages have the same crash bug… I am going to upload them together with the old RC1 packages. The crash occurs in a bit of assembly code in the “COPY64” routine in modules/codec/avcodec/copy.c. If you add “–no-sse2 –no-sse41” then effectively this routine will not be used (but since SSE support gets disabled this way, playback of non-vaapi supported video formats will be somewhat slower). By the way, if you want to see what video formats are accelerated through VAAPI, run the command “vainfo” which will list the supported formats.